Danny Deville had early success as a reliever with short-season Spokane in 1989 and his teammates took notice. After a mid-July game where Deville lowered his ERA to 0.55, teammate Rico Coleman praised the right-hander to The Spokane Spokesman-Review. Deville went on to have a respectable 2.58 ERA overall that year. He couldn't keep up that success. He played two more seasons. He never made AA. 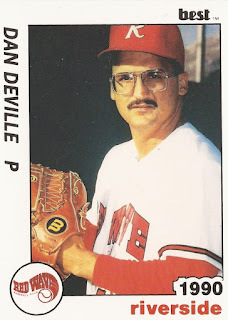 Deville's career began that year in 1989, taken by the Padres in the 29th round of the draft out of Cal State Fullerton. Deville was also credited as Dan Deville. At Fullerton, Deville picked up his fourth win of 1988 with a four-hitter where he set down 14 straight at one point. His seventh victory came in May on a seven-hitter. With the Padres, Deville started at Spokane. He went three innings without giving up a hit in early July, had two innings of shutout relief later that month. He went seven innings in an August start, giving up five hits and no runs. In late-June, Deville picked up his first professional win where he saw his team come back for the victory. "But I don't think you want to give up on this club," Deville told The Spokesman-Review after that game. "I know we're going to score a lot of runs. I don't see us losing a lot of one-run ballgames with the guys we've got." Deville went 4-2 overall that year, with five saves and that 2.58 ERA in 23 outings, one start. He moved to high-A Riverside for 1990. He got 42 outings there, one start, and went 3-2, with a 4.67 ERA. Deville's final season came in 1991 at high-A High Desert. He had a 5.63 ERA there, with one win and four losses, ending his career.